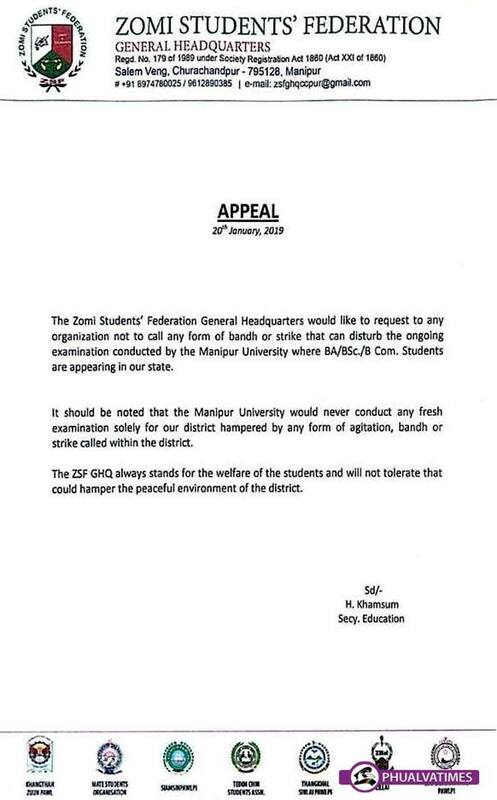 The Zomi Students’ Federation General Headquarters would like to request to any organization not to call any form of bandh or strike that can disturb the ongoing examination conducted by the Manipur University where BA/BSc./B Com. Students are appearing in our state. It should be noted that the Manipur University would never conduct any fresh examination solely for our district hampered by any form of agitation, bandh or strike called within the district. The ZSF GHQ always stands for the welfare of the students and will not tolerate that could hamper the peaceful environment of the district.